The 2015-2016 season was one of hope. The team was young, with only three seniors on the squad. Four of the five starters were sophomores or younger. To add to the mix was a new coaching staff. Head Coach Nathan McGuire was given the responsibility of taking the young team back to the top of the conference. McGuire was assisted by Katie Ahlstrom and Val Roseth. The season’s opening games were not very pretty. The team lost three of their first four games. In the opening game Hopkins took it to the Tigers to school. South lost by 39, 84-45. Game two showed an improvement, however the results were the same with the Tigers losing by 29, 90-61. South earned their first win of the season against Richfield. The 23-point win, 67-44, finally put the Tigers in the win column. Game four was a loss to Orono, 69-45. Two wins followed. Columbia Heights lost by 18, 66-48. Senior Adria Stewart scored 25 points. In the first conference game of the season, Washburn was the victim. The Tigers took the lead and never looked back winning 74-51. Morgan Hill scored 27 points leading the Tigers to the win. The Tigers returned to losing when they played St. Croix Lutheran. South lost by 25, 69-44. The next game against St. Paul Central needed extra time to decide the winner. The game was tied after regulation. During overtime, Central took control and handed the Tigers their fifth loss of the short season, 64-59. The Tigers went into Winter Break after playing North. The Polars gave the Tigers a good game, but they could not contain Morgan Hill, who scored 30 points in the 75-62 win. The Tigers came back from break and played Henry. South was again led by Morgan Hill, who scored 27 points in the 64-45 win. Hill also scored her 1000th career point during this game. A tough Lakeville South team was the next opponent. Lakeville South led by as many as 18 during the game. The Tigers cut the deficit to six point with about a minute to play in the game. Unfortunately, the Tigers lost 54-48. South remained undefeated in the conference with a 47-26 win against Minneapolis Edison. The Tigers took an 18-4 lead going in to halftime and never turned back. The Tigers were lead in scoring by the Hill sisters. Morgan Hill finished the night with 15 and Jade Hill finished with 13. The Tigers travelled to Southwest in their next game. Both teams were undefeated going into the game, so the winner would take sole possession of the conference lead. Southwest ended up winning 57-44. The loss to Southwest seemed to spark something in the Tigers. South won 10 of their last 13 games. Roosevelt was the first opponent during this streak. South used their speed to win 78-59. Stillwater was the next opponent. Seventh-grader Jade Hill led the team to a 66-52 win with her 27 points. Washburn fell next 55-47. Morgan Hill paced the Tigers with 21 points. East Ridge came to South for the following game. Morgan Hill scored 24 points in a losing cause. East Ridge won 78-51. The next game saw South playing North. The Hill sisters led the way in the 82-67 victory. Morgan scored 25 and Jade scored 20. Centennial handed the Tigers a loss, 62-36. Henry lost next, 67-37. The game was a total team effort with many players scoring. Waconia put up a very tough game. The final score had South winning 67-60. South was led by Morgan Hill, who scored 31 points, and Freshman Solana Cushing, who scored 20 points. South played Edison and won 52-40. Solana Cushing had another big night, scoring 20 points. Fifteen points came on five 3-point shots. South hosted Minnehaha Academy and again won 68-63. Morgan Hill led the way with 25 points. Solana Cushing, Adria Stewart and Jade Hill each scored 12 points. This set up a rematch with Southwest. The game was played at South. South’s only conference loss was to Southwest in their earlier game. Southwest was undefeated at the time. Southwest had the size, but South used their speed to take control of the game. South amassed a double-digit lead by halftime. Southwest made a push to get back into the game but South held the Lakers off. At the end of the game, South had a 61-50 victory. Solana Cushing led the way with 22 points on six three-pointers. Southwest finished the season with an 11-1 record. South could tie for the conference lead with a win in their next game against Roosevelt. The Tigers could taste a share of the title and made sure they earned it with a total team victory. The final score was 80-19. Since there was a tie in the conference, the rule to determine who represented Minneapolis in the Twin City game is as follows: 1) if one team beats the other both times, the winning team represents Minneapolis; 2) f the two teams split, the team playing least recently represents Minneapolis. Since Southwest has not played since 1981 and South played in 2011, Southwest would represent Minneapolis. South finished off the regular season with 63-38 loss to Wayzata. South played Robbinsdale Armstrong in the Region playoffs. The game was tied after regulation. During overtime, Armstrong outscored the Tigers, ending South’s season 62-56. 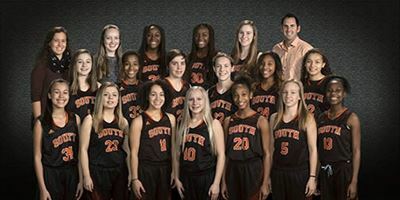 South finished the Conference season tied for first place with Southwest, each with 11-1 records. Overall, South was 16-11. Four players were named to the All-Conference squad: Senior Adria Stewart, Sophomore Morgan Hill, Freshman Solana Cushing and 7th grader Jade Hill. Morgan Hill was named Conference Player of the Year. The JV team finished in 4th place with a 5-5 conference record. They were 7-17 overall. The C-Squad finished in 3rd place with an 8-4 record. They were 11-13 overall.